eTAP Global Ambassador Program’s Mission: Help Every Child Succeed! Dove. A symbol of Love, peace, prosperity from the creator. By applying to become an Ambassador, indicate you have a strong desire to join eTAP Ambassadors mission. 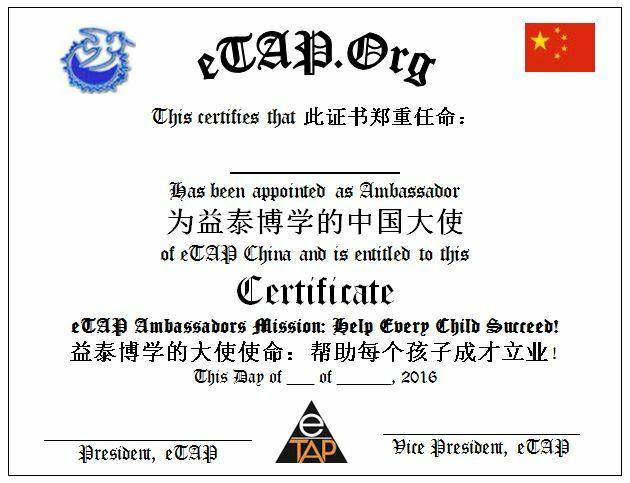 By accepting the Certificate, you committed to eTAP Ambassador mission in every opportunity to support eTAP to Help every child succeed! * In specific: You stand as eTAP Ambassador , once a week to tangibly provide info about eTAP and How eTAP can help students succeed to your network such as wechat or face book or twitter. If you do this in an event, make sure take photos to post at your network and our eTAP Ambassador & Friends WeChat Group. A global school with unlimited highest quality rich resource for every student succeed at ease, peace, efficiency & confidence! The richness and the magnificence are unlimited and endless. Here refer to eTAP resource to help every student succeed.